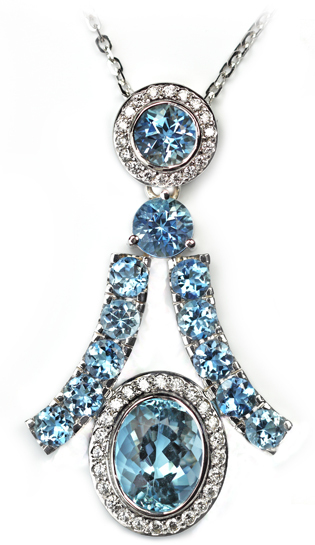 I created this pendant and earrings in my favorite monochromatic color of the blue Aquamarines. When my stone cutters from Idar-Oberstein, Germany showed me the parcel of the blues I just had to buy them all! Perfectly cut and flawless, they sparkle and when put together exhibit a soft blue glimmer that can be worn with everything from evening to day to late-night. 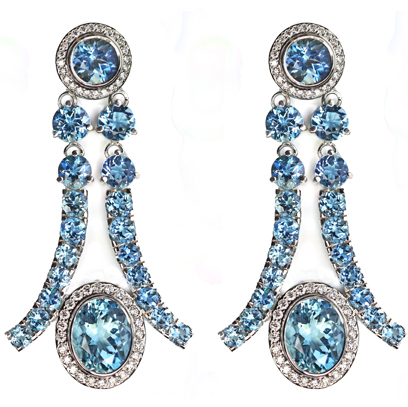 Mixed with white Diamonds set in 18k, they are one of a kind fine jewelry and totally chic. And, who doesn’t LOVE Art Deco? I am inspired from the designs of the Art Deco period–clean, simple lines that are curvilinear depicting the fluidity of movement.